Rice University undergraduate students were among the finalists in the 2013 Collegiate Inventors Competition. Matthew Nojoomi, Michael Pan, Kamal Shah, and Erica Skerrett with Advisor Rebecca Richards-Kortum entered an inexpensive mechanical IV Drip with an automatic volume regulator to prevent overhydration. The competition encourages invention, entrepreneurship, and creativity in students who are working on cutting-edge inventions at their colleges and universities. Outstanding inventions in science, engineering, mathematics, technology (STEM) and other creative fields are judged by a panel of National Inventors Hall of Fame Inductees and USPTO officials. For a more detailed description of their invention and information about other entries see the current finalists' link on the contest webpage. Read more about the contest on the Department of Commerce blog. The United States Patent and Trademark Office (USPTO) will host the next public Software Partnership Meeting on Thursday, December 5, 2013, from 1:00pm – 4:00pm at the Madison Auditorium North on the USPTO campus in Alexandria, Virginia. The meeting will focus on educating the public about prior art resources utilized by USPTO examiners in the software area. There will be presentations from external speakers on additional prior art resources and search techniques followed by an interactive discussion with the meeting attendees. Submit requests to attend the meeting in person by electronic mail through the Internet to SoftwareRoundtableAlexandria@uspto.gov. Requests for attendance must include the attendee's name, affiliation, title, mailing address, and telephone number. An Internet e-mail address, if available, should also be provided. More information is available on the Software Partnership page at http://www.uspto.gov/patents/init_events/software_partnership. SUMMARY: In accordance with the Paperwork Reduction Act (PRA), the United States Patent and Trademark Office (USPTO) published a notice inviting written public comment on the renewal of information collection 0651-[[Page 68038]]0032, Initial Patent Applications. The USPTO plans to conduct a roundtable to obtain additional public input regarding the burden associated with the Initial Patent Applications collection and ways to potentially reduce it. By providing this additional opportunity for public input, the USPTO hopes to increase the level of stakeholder participation in this information collection renewal. The roundtable will be open for any member of the public to provide input. DATES: Roundtable: The roundtable will be held on Wednesday, December 11, 2013, beginning at 10:00 a.m. Eastern Daylight Time (EDT), and ending at 12:00 p.m. EDT. Registration: Registration for the roundtable is requested by December 4, 2013. The Pro Bono program launched in June 2011 was designed to assist financially under-resourced independent inventors and small businesses. The USPTO has recently announced a new charter agreement placing the responsibility of the regional pro bono programs in the hands of a newly formed advisory council. Over 30 representatives from regional inventor assistance programs, major IP associations and IP law school programs were present at the ceremony that took place in the chambers of Chief Judge Randall Rader of the Court of Appeals for the Federal Circuit on Friday, October 25. The advisory council will be responsible for the existing pro bono programs and those yet to come. A link to the Pro Bono page also appears on Fondren's Inventor Resources/Training page. The USPTO is proposing to eliminate the Patents Search Templates from the USPTO Web site. In 2006, the United States Patent and Trademark Office (USPTO) implemented Patents Search Templates, which are United States Patent Classification (USPC) indexed search templates that were created to better identify the field of search, search tools, and search methodologies which should be considered each time an invention related to a particular USPC is searched. There are over 1200 search templates covering more than 600 USPC classes and subclasses. Historically, usage of the search templates by the public has been extremely low. Additionally, various aspects of the search templates, such as references to commercial database vendor information, are in need of updating. Further, the USPTO launched a new classification system, the Cooperative Patent Classification (CPC)system, in January 2013 that is based on the International Patent Classification (IPC) system. The CPC, a joint patent classification system developed by the USPTO and the European Patent Office (EPO),incorporates the best classification practices of both the U.S. and European systems. Since CPC is a detailed, collaborative, and dynamic system that will enable patent examiners and the public to efficiently conduct thorough patent searches, the search templates will become obsolete. Before eliminating the search templates from the USPTO Website, the Office is requesting comments from the public. SUMMARY: The Patent Law Treaties Implementation Act of 2012 (PLTIA)amends the patent laws to implement the provisions of the Hague Agreement Concerning International Registration of Industrial Designs(Hague Agreement) in title I, and the Patent Law Treaty (PLT) in title II. The PLT harmonizes and streamlines formal procedures pertaining to the filing and processing of patent applications. This final rule revises the rules of practice for consistency with the changes in the PLT and title II of the PLTIA. The United States Patent and Trademark Office(Office) is implementing the Hague Agreement and title I of the PLTIA in a separate rulemaking. The notable changes in the PLT and title II of the PLTIA pertain to: The filing date requirements for a patent application; the restoration of patent rights via the revival of abandoned applications and acceptance of delayed maintenance fee payments; and the restoration of the right of priority to a foreign application or the benefit of a provisional application in a subsequent application filed within two months of the expiration of the twelve-month period (six-month period for design applications) for filing such a subsequent application. This final rule also revises the patent term adjustment provisions to provide for a reduction of any patent term adjustment if an application is not in condition for examination within eight months of its filing date or date of commencement of national stage in an international application, and contains miscellaneous changes pertaining to the supplemental examination, inventor's oath or declaration, and first inventor to file provisions of the Leahy-Smith America Invents Act (AIA). The United States Patent and Trademark Office (USPTO) on Wednesday, October 23, 2013 at its headquarters in Alexandria, VA. will hold a one-day seminar on using the Madrid Protocol. This seminar targets practitioners who are familiar with and have used the Madrid Protocol. The purpose of the seminar is to provide practical information on common issues as well as maintaining and managing the resulting international registration. Seminar highlights include: WIPO resources; issues to consider when preparing to file and actually filing an international application; the USPTO review process for certification of the international application; International Bureau review of the international application; and issues related to changing and renewing the international registration. A detailed agenda will be provided at a later date. To attend in person, please send your name to TMFeedback@uspto.gov no later than c.o.b. Friday, October 18, with the subject line "Madrid Protocol advanced training." Webcast instructions and agenda, are now available at http://www.uspto.gov/trademarks/notices/Madrid_Protocol_Seminar.jsp. Registration is not needed if you only plan to view the webcast. If possible, the USPTO will attempt to make a version available for viewing at a later time. Please note: Due to funding issues from the government shutdown, the 18th Annual Independent Inventors Conference will not be held at this time. The USPTO plans to reschedule the conference. See more at http://www.uspto.gov/inventors/events/Alexandria_Main.jsp . Original message: The United States Patent and Trademark Office (USPTO) will hold the 18th Annual Independent Inventors Conference on October 11-12, 2013 at its headquarters in Alexandria, VA. Co-hosted by Sodexo®, the conference will provide inventors and innovators with education from intellectual property experts in their respective fields and practical advice from successful inventors. 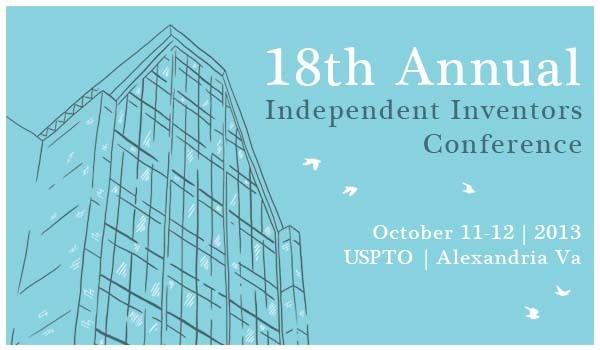 Conference highlights will include presentations, workshops, and one-on-one advisory sessions conducted by senior USPTO officials and others who will inform and answer questions about patents and trademarks. There is a pre-conference workshop on October 10, 2013 from 5-7 p.m.
Space is limited, so register early. Registration is now open. A registration fee of $90 per person includes all sessions and presentations, refreshments, lunch (Friday and Saturday) and a networking session on Friday evening. For additional information, visit www.uspto.gov/inventors/events/Alexandria_Main.jsp or 866-767-3848. Attendees will have the opportunity to ask questions during each segment. companies are realizing patents "are a more valuable asset than once assumed"
Good News - Patent Images Now in PDF Format! Viewing, printing, downloading, and emailing sections of patents from the USPTO website just became easier. Images of U.S. patents in the Patents Full-Text database (PatFT) and U.S. published patent applications in the Applications Full-Text database (AppFT) on the USPTO website are now in PDF format. When you click the “Images” button above the html version of a patent or published patent application, the patent will appear in PDF, not TIFF format. You no longer have to download a TIFF plug-in to see the images. The United States Patent and Trademark Office (USPTO) is required by 35 U.S.C. 131 and 151 to examine applications and, when appropriate, allow applications and issue them as patents. When an application for a patent is allowed by the USPTO, the USPTO issues a notice of allowance and the applicant must pay the specified issue fee (including the publication fee, if applicable) within three months to avoid abandonment of the application. This collection of information also encompasses several actions that may be taken after issuance of a patent, pursuant to Chapter 25 of Title 35 U.S.C. A certificate of correction may be requested to correct an error or errors in the patent. For an original patent that is believed to be wholly or partly inoperative or invalid, the assignee(s) or inventor(s) may apply for reissue of the patent, which entails several formal requirements, including provision of an oath or declaration specifically identifying at least one error being relied upon as the basis for reissue and stating the reason for the belief that the original patent is wholly or partly inoperative or invalid (e.g., a defective specification or drawing, or claiming more or less than the patentee had the right to claim in the patent). The public uses this information collection to request corrections of errors in issued patents, to submit applications for reissue patents, and to submit issue fee payments. to extend the term of protection under a patent to compensate for delay during regulatory review and approval by the Food and Drug Administration (FDA) or Department of Agriculture. Only patents for drug products, medical devices, food additives, or color additives are potentially eligible for extension. The maximum length that a patent may be extended under 35 U.S.C. 156 is five years. SUMMARY: On November 29, 1999, the President signed into law the Patent and Trademark Office Efficiency Act (the ``Act''), Public Law 106-113, which, among other things, established two Public Advisory Committees to review the policies, goals, performance, budget and user fees of the United States Patent and Trademark Office (USPTO) with respect to patents, in the case of the [[Page 49261]]Patent Public Advisory Committee, and with respect to trademarks, in the case of the Trademark Public Advisory Committee, and to advise the Director on these matters (now codified at 35 U.S.C. 5). The America Invents Act Technical Corrections Act made several amendments to the 1999 Act, including the requirement that the terms of the USPTO Public Advisory Committee members be realigned so that by 2014, December 1 be used as the start and end date, with terms staggered so that each year three existing terms expire and three new terms begin on December 1. Public Law 112-274, Sec. 1(l)(2) (January 14, 2013). Through this Notice, the USPTO is requesting nominations for up to three (3) members of the Trademark Public Advisory Committee for terms of approximately three years that begin on December 6, 2013. There are no vacancies expected on the Patent Public Advisory Committee for December 2013. Accordingly, no nominations are being sought for the Patent Public Advisory Committee at this time. DATES: Nominations must be postmarked or electronically transmitted on or before September 30, 2013. On July 31, 2013 the Commerce Department posted a press release describing its green paper designed to update copyright policies for the Internet Age. Copyright Policy, Creativity, and Innovation in the Digital Economy (Green Paper) "is a product of the Department of Commerce’s Internet Policy Task Force (IPTF) with input from the U.S. Patent and Trademark Office (USPTO) and the National Telecommunications and Information Administration (NTIA)." It is billed as "most thorough and comprehensive analysis of digital copyright policy issued by any administration since 1995." The Green Paper can be found online at: http://www.uspto.gov/news/publications/copyrightgreenpaper.pdf. Jennifer Bogo from Popular Science (popsci.com) recently interviewed associate patent commissioner John Calvert about changes in the patent system due to the America Invents Act (AIA). John's answers are available at http://www.popsci.com/technology/article/2013-04/qampa-patent-commissioner-john-calvert. Keep up with other patent and trademark news by accessing the links of USPTO News on the lower right of the USPTO home page. Video 1 explains what constitutes prior art under the new law. Video 2 discusses the exceptions to the prior art covered in the first video. Video 3 talks about a few more types of prior art. Video 4 discusses exceptions to the prior art mentioned in video 3. 35 USC 102 refers to Title 35 of the United States Code, section 102, which covers the first-to-file rules. SUMMARY: The United States Patent and Trademark Office (Office or USPTO) is revising the rules of practice to implement the changes with respect to inter partes review that are set forth in section 1(d) of the Act to correct and improve certain provisions of the Leahy-Smith America Invents Act and title 35, United States Code (``AIA Technical Corrections Act''). Consistent with the statutory changes, this final rule eliminates the nine-month ``dead zone'' for filing an inter partes review petition challenging a first-to-invent patent or reissue patent. Under the final rule, a petitioner may file an inter partes review petition challenging a first-to-invent patent or reissue patent upon issuance, including during the first nine months after issuance. DATES: Effective Date: March 25, 2013. SUMMARY: The United States Patent and Trademark Office (USPTO) published a request for comments on the preparation of patent applications, seeking input on potential practices that applicants can employ at the drafting stage of a patent application in order to facilitate examination and bring more certainty to the scope of issued patents. The USPTO has received several requests for additional time to submit comments on the preparation of patent applications. Accordingly, the USPTO is extending the comment period to provide interested members of the public with additional time to submit comments to the USPTO. DATES: Comment Deadline Date: To be assured of consideration, written comments must be received on or before April 15, 2013. SUMMARY: The United States Patent and Trademark Office (USPTO) published a notice announcing the formation of a partnership with the software community to enhance the quality of software-related patents(Software Partnership), and a request for comments on the preparation of patent applications, seeking input on potential practices for preparing patent applications. The USPTO also conducted two roundtables to obtain public input from organizations and individuals on topics relating to the quality of software-related patents and the preparation of software-related patent applications including: establishing clear boundaries for claims that use functional language; identifying additional topics for future discussion by the Software Partnership; and potential practices that applicants can employ at the drafting stage of a patent application in order to facilitate examination and bring more certainty to the scope of issued patents. The USPTO has received several requests for additional time to submit comments in response to the notice. Accordingly, the USPTO is extending the comment period to provide interested members of the public with additional time to submit comments to the USPTO. The final rule published in the Federal Register on February 14, 2013 discussing the revised rules of practice for the first inventor to file provisions was missing text about claims for priority regarding a foreign application filed under the Patent Cooperation Treaty (PCT). See this new final rule at http://www.gpo.gov/fdsys/pkg/FR-2013-03-14/html/2013-05815.htm to read the missing text. The United States Patent and Trademark Office (USPTO) will be providing public training on the first-to-file rules and examination guidelines of the Leahy-Smith America Invents Act (AIA). The public training session will be held on Friday March 15, 2013 at the USPTO Headquarters in Alexandria, Virginia from 1:00pm-4:00pm Eastern Daylight Time (noon-3:00pm Central). The training session will be webcast. Below are the instructions for the forum agenda and webcast access which are also available on the AIA micro-site at www.uspto.gov/AmericaInventsAct. The first-inventor-to-file final rules and guidance become effective on March 16, 2013, and the micro entity and patent fee final rules become effective on March 19, 2013. For a discussion of micro entity fees, see the Feb. 2013 edition of the USPTO's Inventors Eye. You can also find the link on Fondren's Patent Inventor Resources and Training page under USPTO Online Training. On December 18, 2012, the USPTO published a request for comments on a patent small claims proceeding. The notice invited the public to submit written comments on or before March 18,2013. The USPTO is now extending the period for submission of public comments until April 30, 2013. For more information access the Federal Register Notice at http://www.gpo.gov/fdsys/pkg/FR-2013-03-06/html/2013-05162.htm . The original comment request of Dec. 18, 2012 is available at http://www.gpo.gov/fdsys/pkg/FR-2012-12-18/html/2012-30483.htm. The United States Patent and Trademark Office (USPTO) released a new calculator that assists members of the public when estimating the expiration date of a utility, plant, or design patent. The calculator provides a best estimate of a patent’s expiration date, based on a comprehensive list of factors than can be found in USPTO records. Download the calculator at http://www.uspto.gov/patents/law/patent_term_calculator.jsp. Visit the AIA micro-site http://www.uspto.gov/aia_implementation/index.jsp to view other newly added features. Visit the AIA micro-site to view other newly added features. On Feb. 14, 2013 the Federal Register issued a final rule about changes necessary to implement the first to file provision of the Leahy-Smith America Invents Act. To see the complete text of this rule, access http://www.gpo.gov/fdsys/pkg/FR-2013-02-14/html/2013-03453.htm. A summary follows. SUMMARY: The Leahy-Smith America Invents Act (AIA) amends the patent laws pertaining to the conditions of patentability to convert the U.S. patent system from a ``first to invent'' system to a ``first inventor to file'' system; treats U.S. patents and U.S. patent application publications as prior art as of their earliest effective U.S., foreign, or international filing date; eliminates the requirement that a prior public use or sale be ``in this country'' to be a prior art activity; and treats commonly owned or joint research agreement patents and patent application publications as being by the same inventive entity for purposes of novelty, as well as nonobviousness. The AIA also repeals the provisions pertaining to statutory invention registrations.The United States Patent and Trademark Office (Office or USPTO) is revising the rules of practice in patent cases for consistency with, and to address the examination issues raised by, the changes in section3 of the AIA. DATES: Effective date: The changes in this final rule are effective on March 16, 2013. The United States economy depends on high quality and timely patents to protect new ideas and investments for business and job growth. To reduce the backlog and decrease patent application pendency,the USPTO must examine significantly more patent applications than it receives each year for the next several years. Bringing the number of applications in the backlog down to a manageable level, while at the same time keeping pace with the new patent applications expected to be filed each year, requires the Office to collect more aggregate revenue than it estimates that it will collect at existing fee rates. The Office estimates that the additional aggregate revenue derived from this fee schedule will enable a decrease in total patent application pendency by 11.3 months during the five-year planning horizon (fiscal year (FY) 2013-FY 2017), thus permitting a patentee to obtain a patent sooner than he or she would have under the status quo fee schedule. The additional revenue from this fee schedule also will recover the cost to begin building a three-month patent operating reserve. The Office estimates that the patent operating reserve will accumulate almost two months of patent operating expenses by the end of the five-year planning horizon (FY 2013-FY 2017) and will reach the three-month target in FY 2018, thereby continuing to build a sustainable funding model that will aid the Office in maintaining shorter pendency and an optimal patent application inventory. Additionally, the fee schedule in this final rule will advance key policy considerations while taking into account the cost of individual services. For example, the rule includes multipart and staged fees for requests for continued examination (RCEs), appeals, and contested cases, all of which aim to increase patent prosecution options for applicants. Also, this rule includes a new 75 percent fee reduction for micro entities and expands the availability of the 50 percent fee reduction for small entities as required under section 10, providing small entities a discount on more than 25 patent fees that do not currently qualify for a small entity discount. USPTO/Smithsonian Collaborate to Open an "Innovation Pavilion"
On January 16, 2013 the USPTO announced a collaboration with the Smithsonian to open an "Innovation Pavilion" to be housed in the Smithsonian's Arts and Industries (A&I) Building in Washington, D.C. once it reopens in 2014. The space is designed to "serve as a forum for public discussions, symposiums, workshops, and recognition ceremonies related to American innovation, highlighting the vital role patents play in supporting that innovation." The Smithsonian and USPTO will also collaborate on an Innovation Expo to be held June 20-22, 2013 at the USPTO headquarters in Alexandria, Virginia. The USPTO is seeking comments regarding improving the quality of issued patents. See complete information for the Jan. 15, 2013 Federal Register Comment Request at: http://www.gpo.gov/fdsys/pkg/FR-2013-01-15/html/2013-00690.htm. The summary is listed below. SUMMARY: The United States Patent and Trademark Office (USPTO) is seeking to improve the quality of issued patents. In this notice, the USPTO is focusing on potential practices that applicants can employ at the drafting stage of a patent application in order to facilitate examination and bring more certainty to the scope of issued patents. To that end, the USPTO is requesting input from interested members of the public on the specific practices set forth in the ``Topics for Public Comment'' section below. While this notice is directed to potential practices that applicants can employ, the USPTO also plans to issue a separate notice building on internal initiatives and further identifying potential practices the Office can employ to also facilitate examination and bring more certainty to the scope of issued patents. The USPTO intends to publish the separate notice subsequent to its review of comments received responsive to the present notice. On January 3, 2013, the USPTO published a notice announcing the formation of a partnership with the software community to enhance the quality of software-related patents (Software Partnership). See Request for Comments and Notice of Roundtable Events for Partnership for Enhancement of Quality of Software-Related Patents, 78 FR 292 (Jan. 3, 2013). The Software Partnership notice seeks public comment on specific topics related to enhancing the quality of software-related patents,and announces two roundtable events, which will not only offer participants an opportunity to provide oral comments on the topics presented in the Software Partnership notice but also on the topics set forth in the present notice, to the extent they apply to software- related patents. Comment Deadline: To be assured of consideration, written comments must be received on or before March 15, 2013. No public hearing will be held. The United States Patent and Trademark Office (USPTO) implemented a pilot program (Extended Missing Parts Pilot Program) in which an applicant, under certain conditions, can request a twelve- month time period to pay the search fee, the examination fee, any excess claim fees, and the surcharge (for the late submission of the search fee and the examination fee) in a nonprovisional application. The Extended Missing Parts Pilot Program benefits applicants by permitting additional time to determine if patent protection should be sought--at a relatively low cost--and by permitting applicants to focus efforts on commercialization during this period. The Extended Missing Parts Pilot Program benefits the USPTO and the public by adding publications to the body of prior art, and by removing from the USPTO's workload those nonprovisional applications for which applicants later decide not to pursue examination. The USPTO is extending the Extended Missing Parts Pilot Program until December 31, 2013, to better gauge whether the Extended Missing Parts Program offers sufficient benefits to the patent community for it to be made permanent. For more information, access the Federal Register notice at http://www.gpo.gov/fdsys/pkg/FR-2013-01-10/html/2013-00336.htm . The USPTO is seeking comments before March 18, 2013 about whether to develop a small claims proceeding for patent enforcement. "In particular the USPTO seeks information about core characteristics of a patent small claims proceeding including characteristics such as subject matter jurisdiction, venue, case management, appellate review, available remedies, and conformity with the U.S. constitutional framework (e.g. 7th Amendment)." For more information, see the Federal Register comment request of Dec. 18, 2012 at http://www.gpo.gov/fdsys/pkg/FR-2012-12-18/html/2012-30483.htm.